We have been proudly servicing Orange County and Los Angeles County against rodents and pests since 2008. There are so many concerning issues from vermin pests and rodents that causes an alarming amount of bacteria and diseases to humans. We are here to prevent any types of health issues since our goal is to protect the health and safety for each of our customers. Your health and family is number one to us. We want you to have peace of mind no matter what type of pest is invading your property. Call for a free survey today. Very professional love having them take care of our homes. I want to thank Brandon and Robert for their professional and polite.All in the experience was wonderful. Such a very nice company to deal with. I am freed from worrying about pests in my home and yard. My dogs enjoy the yard without needing any flea or tick applications. The techs are very polite and very thorough. If u are thinking of hiring a pest service, you will be pleased with Pacific Pest Control. I would certainly recommend family or friends to this service. Our inspector came at the time given, all the information was very clear, the whole process was easy to understand and follow, the workers were there at the time mentioned, to remove the tent as well. The office called with follow up check up concerned. Thank you very much. PPC is always on time and very professional. PPC responds to calls in a timely manner and goes the extra mile to make sure that the customer (me) expectations are met...thank you. very recommendable; great customer service. even after more than a month of service they continue to call for any thing they can provide without additional pay. hired them to remove and capture rodents in our attic. in addition they covered all possible opening on the exterior of the house including roof vents, provided weekly checkups to ensure everything was completed properly. excellent customer service and product support. I had a severe rat infestation in my attic and walls due to a bee hive that was also in the walls. They removed the bee hive and honey and sealed off the house. Then they trapped all the rats. It was a huge job, and they were awesome. Always responded immediately when I needed them to come out. Sofar so good. First treatment, personable representative . Time will tell but I am currently very satisfied. affordable, amazing, dependable, diligent, efficient, ethical, experienced, fair, flexible. Ver reasonable prices. They do not do aggressive upsell. Excellent service with great results. I would highly recommend. Pacific Pest Control was the solution to my Problem. I had an awful Rat Infestation! Pacific Pest Control came in, found the Points of Entry, plugged them, set traps, and the Rats were Gone! I am extremely happy with Pacific Pest Control. After a terrible experience with another company, I was referred to Pacific Pest through a friend who had used them. I was under a really tight time constraint to get the work done and even though Pacific Pest was very busy, they went above and beyond to make sure the work was done asap for me. Their contract was simple and easy to understand & they did exactly what they said they would. Office customer service is also excellent. Don't use anyone else! nice folks. spraying was quick and easy. no tiny ants after the first spraying. yay! we had them come for a followup. I can't say enough good things about pacific pest control. They are always on time or early for the appointments and always listen to the concerns I have for pest issues going on at my house. I live next to a canyon so I always have some new little uninvited creature at my place. They have my roof rat problem under control and I couldn't be happier. I used Orkin before them and would never go back. Always on time and very efficient. We had a serious ant problem but are in great shape now and ant free! Really friendly team with affordable price options. Have always been able to schedule with ease and fitnus in when we had an urgent ant issue. Overall, they've done a great job. We paid much more than other quotes, but we got what we paid for, a thorough job well done. I am very happy w pacific pest control services. They have been working w me to get rid of my rat problem. I would recommend their services. Charlene. We live by the golf course and have issues of number of rats. I am satisfied with them because they always show up on time and take care of business. Always courteous technicians. Reliable & timely service. I appreciate the free return service if critters arrive between scheduled spraying. 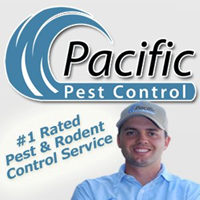 I've used Pacific Pest Control twice and they've been prompt, professional and responsive. I absolutely hate dealing with this particular problem, but they try to make it as palatable as possible for me! I appreciate that and them! Very good company!! Always there when they say they will be - love timely service! This was the best experience possible for ridding our house of intruders! We were so relieved when the process was complete. I would highly recommend this company for anyone who is serious about getting rid of their Intruders. Great to work with, informative usually always on time. We were very happy with the nice customer service ! They were prompt and easy to work with and our experience and results so far have been great. I do highly recommend them in fact I was just recommending them yesterday to my neighbor and he replied Oh I called them already to come next week. Awesome !! Pacific Pest Control is very professional. They always came with advance notification and once the service is done, they sent out detail descriptions about service time and items. Most importantly, my house is absolutely bugs and ants free! They have visited us twice so far, and both times were different technicians. They were both polite and excellent in their service. The process was well explained and has functioned as explained. We have not had ants in the home since and in general we only find the occasional spider, not everywhere like before. I Love Pacific Pest Control!!! They are always Ready to Help. They Listen, are On Time, Very Professional, Caring, and Very Honest!! being there to Help us. Pacific Pest Control is the most reliable pest control service we have used. They guarantee their work and are very gracious about coming out to treat issues that come up in-between regularly scheduled appointments. Since having Pacific Pest Control come out every 2 months I haven't seen any bugs in my house or around the house outside. I haven't had to have them come back out in between visits. I would definitely recommend this company. They have great service and very friendly staff in the office and the guys who come out to spray are very thorough and take their time. Pacific Pest Control rodent proofed our home and there have been no further rodents issues. Also I was reluctant to use insecticides but the technician recommended Essentria, which is non toxic to my pets, and hopefully the environment also. It controls the spiders and ants and we have a quarterly service. Everyone that has been to our home has been professional and courteous. They are also very punctual about appointments and communicate by email and telephone follow up. I'm very happy with the service and plan to continue. Contacted them last year due ants, n spiders in our home. We no longer have any pests and service is great! The best!!! Always on time, very knowledgeable,offered me many options( pricing) so that I was comfortable.... and have had no more issues with a huge ant problem.... very happy with the company! Pacific Pest is great to work with! They have innovative ways to control pests and rodents! Great company to work with! Always available when needed, very helpful and professional. I worked with a number of different technicians and all were kind and courteous. Solid, competent work. The only issue was that the service guy said he would call me for an update once he finished the work and he never called. Otherwise, good enough. I have always been more than satisfied with the work done. Everything performed according to plan. I purchased my first home 3 months ago and experienced a rodent issue within weeks of moving in; I called several pest control companies, but Pacific Pest Control was the only company to call me right back . I just had them come out this morning for general fumigation, and will continue using them for all my pest control needs. Their service technicians are very knowledgeable, professional and polite. They show up on time and always give you an ETA within 30 minutes of arrival.